Victoria Beckham daughter Harper had a hilarious reaction to Spice World. Victoria Beckham's daughter Harper watched Spice World and had a valid concern. It may be over two decades old, but we really can’t stop reminiscing about Spice World (a.k.a the best ’90s movie ever). It seems we aren’t the only ones who keep re-watching the iconic movie though. In fact, it seems Victoria Beckham is in the exact same boat. 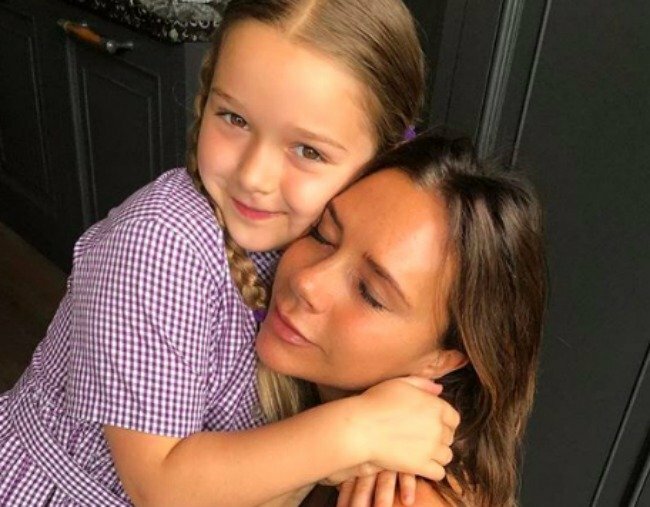 Victoria, a.k.a Posh Spice, recently shared her seven-year-old daughter Harper’s “nap time” on Instagram, which involved watching her mum star in the Spice Girls movie. “Spice World has been on heavy rotation this holiday!” Victoria wrote on her Instagram story. Victoria also shared some of the hilarious questions Harper had for her mum while watching the movie. Like we all were (or still are), Victoria said Harper is “obsessed” with the Spice Girls’ tour bus. "Nap time with Harper!" Image: Instagram. If you need a little refresher, in the movie, The Spice Girls travelled around London in a double-decker bus adorned with the Union Jack. But the best part of all was the interior. While Baby Spice had her very own swing, Posh Spice had a catwalk, where she modelled her "little Gucci dress", of course. "Not only is Harper obsessed with the Spice Bus..." Victoria wrote. "She now wants a &apos;little Gucci dress&apos;." Us too, Harper, us too. The Beckham&apos;s youngest child also had some question&apos;s about her mum&apos;s less than practical outfits, especially during the boot camp sequence, and honestly, we can relate. "Mummy, why are you wearing a dress?" Harper asked. While the four other Spice Girls wore army fatigues, Posh wore a camouflage mini dress and honestly, we can&apos;t imagine anything more impractical. Do you remember watching Spice World? Tell us in the comments section below.